On most days, I make it a point to cook dal along with a vegetable curry made separately or added to the dal itself. Today, I was craving for some typical Maharastrian bhaaji (vegetable) to go with my simple dal tadka and rice. As I scouted my fridge, I came across these organic bhendis (okra/ladyfingers) waiting to be cooked. 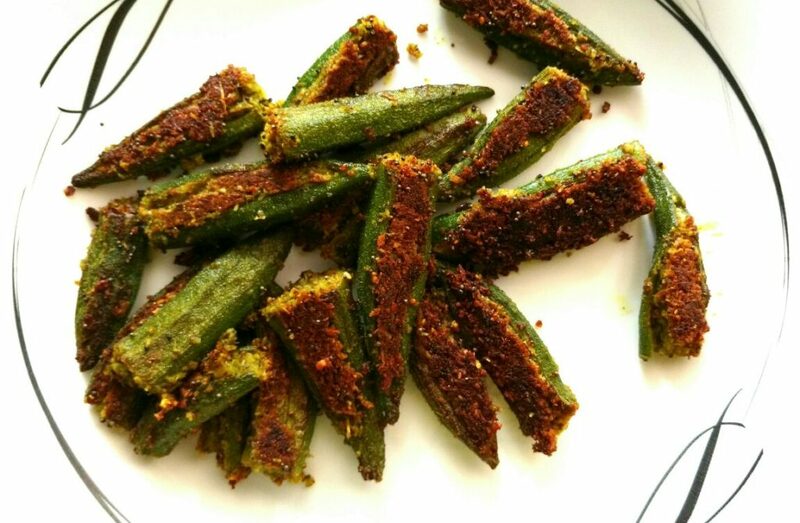 The tender and slender bhendis were the perfect lot for making bharli bhendi (stuffed okra). Being a south Indian who was born and brought up in Maharashtra, the local Maharashtrian cuisine has always held a special place in my heart! The sprinkle of sugar with a dash of lime; the generous garnish of freshly scraped coconut with finely chopped coriander leaves; the heat of lavangi mirchi along with fragrance of goda masala, bring out the sweet, sour and fiery tastes of its delectable cuisine. The recipes especially from the konkan belt of Maharashtra usually tend to go light on complex spices and tries to enhance the original flavour of the dish with the addition of these simple, healthy, yet glorious condiments. Bharli bhendi is one such flavorful dish, simple to make and delicious to eat! Prepare the masala by grinding all the above listed ingredients and mix in the lemon juice and salt. Feel free to adjust the ingredients in the masala to suit your taste. After all, cooking is not an exact science and should satisfy one's taste buds! Fill the masala in the bhendis tightly and keep them ready. Meanwhile, heat a pan to start with the tempering. When the oil is sufficiently hot, add the mustard seeds and wait for it to splutter. Then add the haldi, asafoetida and the stuffed bhendis. Make sure the bhendis are arranged in the pan in a way so that they do not overlap each other.If the pan is small, you can make it separately in two batches.Keep the flame on low to medium heat. After arranging the bhendis, cover the pan with a lid so that the bhendis get cooked evenly. Flip them after every 3-5 minutes till they are crisp and done on all sides.